Perhaps emboldened by composing yesterday's blog entry, husband and I seized an opportunity this evening. Buffy had spent a good hour+ with us downstairs chillin' with a bone while we enjoyed one of the more addictive Showtime series offerings via Netflix. 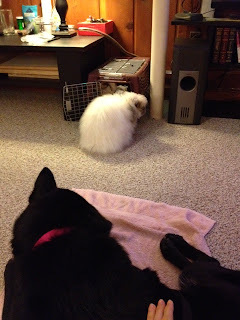 Still in full relaxation mode, Buffy had her leash clipped to her collar, and then we opened the bunny pen door. Bunnies, as you may know, will not necessarily gallop out of their pen when initially summoned. 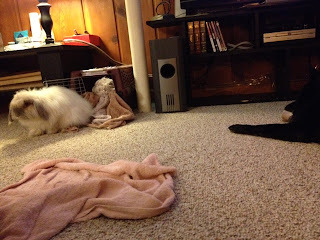 So we waited for a while, petting Buffy as she lazed with her bone, and then LaFeet (by far the braver and more outgoing of the bun pair) made his move. LaFeet hopped on out of the pen and came right over to touch noses with Buffy (who was in full side-recline). They sniffed for a few seconds, and then Buffy turned her head away, back to her bone. LaFeet went along his merry way, looping the room and then going back into his pen for some hay. And thus went the first up-close-and-personal interaction between Buffy and bunny! Athena, by the way, elected to stay with the hay trough for the duration.